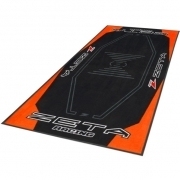 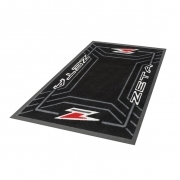 Introducing the Zeta Racing Floor Mat. The Zeta Pit Mat consists of a carpet portion of nylon material excellent in water absorption, durability and abrasion resistance and a base sheet of impermeable TPR material. It's handy to use in the garage or to keep your stand out of the mud at the track.